The portion of distal small intestine is visible with a complete loss of mural detail, thickened hypoechoic parenchyma, and peri-serosal inflammatory fat. Differentials for this type of presentation include intestinal lymphoma or other neoplasia, bowel infarction or spontaneous necrosis. Regional mesenteric lymph node, severely enlarged, hypoechoic, irregular with loss of detail and structure with hyperechoic ill-defined surrounding fat. Suggestive of neoplasia such as round cell neoplasia/lymphoma, or possible lymphadenitis. "Intestinal lymphoma or not: things that look like LSA but are not and are treated differently. Spontaneous necrosis, bowel infarctions, complicated IBD…. cut it or throw pills at it and the importance of a needle. Don't give a freezer sentence to the patient until you enhance your diagnostic objectivity." An 11-year-old Cavalier King Charles Spaniel was presented for poor appetite and diarrhea. CBC revealed anemia and a hematocrit of 33. Blood chemistry revealed a low total protein of 3.4, albumin of 1.4, and ALKP of 487. Exam of the cranial abdomen demonstrated normal liver size, contour, and structure. 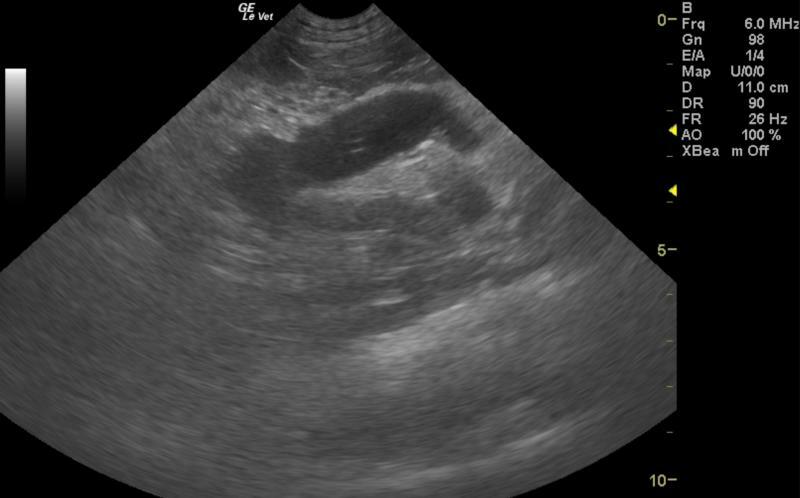 Parenchymal echogenicity was naturally coarse and hypoechoic to the spleen. Vascular and biliary tracts were of normal volume and no evidence of congestion was noted. 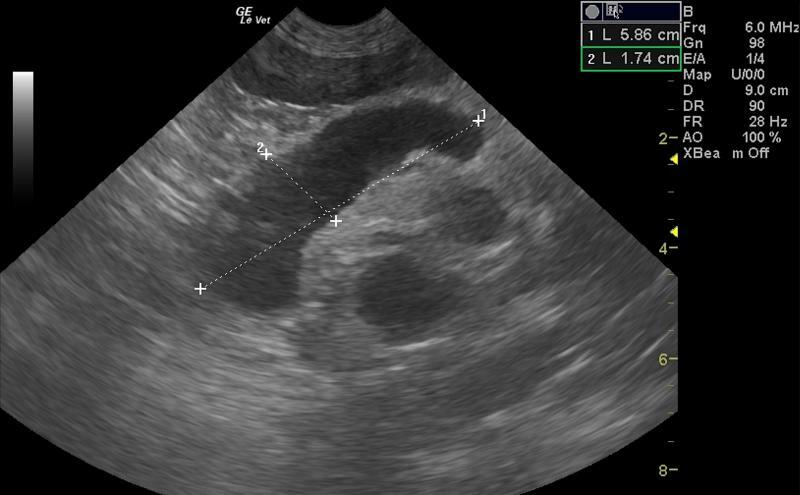 The gallbladder presented thin walls with normal, primarily anechoic content. The cystic and common bile ducts were normal. No periportal lymphadenopathy was evident. No overt structural evidence of inflammatory, infiltrative or regenerative pathology was noted. The gastrointestinal tract presented approximately 30-35 cm of jejunum that was diffusely thickened to a variable degree with loss of detail and regional hyperechoic, ill defined surrounding fat adhered to the serosa. This is consistent with spontaneous necrosis and inflammatory bowel or potential intestinal lymphoma. Loss of mural detail was noted in variable areas of the small intestine. The ileocecal valve, descending duodenum and stomach appeared to be unremarkable. However, the ileum appeared to be adequately intact for at least 8-10 cm proximal to the ileocecal valve. This appears to be all jejunum and ileum from a subjective standpoint. Regional peritonitis was noted throughout the mid-abdomen with free fluid. The free fluid was sampled and found to be flocculent yellow. This is consistent with potential bacterial contamination and transudate likely owing to lymphatic obstruction/strangulation owing to the mesenteric lymph node enlargement that was noted. This encompassed the mesenteric artery. The larger mesenteric node measured 6 x 1.8 cm with dramatic, hypoechoic parenchyma and pericapsular inflammatory pattern that was contributing to the peritonitis presentation. The pancreas itself appeared largely unremarkable other than some extension of the intestinal and mesenteric pathology extending into the regions of the pancreas. The pancreas itself appeared largely unremarkable other than some extension of the intestinal and mesenteric pathology extending into the regions of the pancreas. Both 22-gauge and 25-gauge ultrasound-guided FNA of the mesenteric lymph nodes were performed without complication. Culture was submitted. Abdominocentesis of coalesced free fluid that was found to be modified transudate type fluid was also submitted for potential culture. Given that the free fluid is more of a passive congestion type fluid this is likely deriving from lymphatic obstruction at the mesenteric root as opposed to primary inflammatory fluid deriving from the intestine. Diffuse intestinal thickening in the jejunum to proximal ileum. This appears resectable with aggressive extensive intestinal resection. Concurrent protein losing enteropathy. Concurrent mesenteric lymphadenopathy. This meets neoplastic criteria. Potential suppurative lymphadenitis. Spontaneous necrosis secondary to inflammatory bowel/enteritis, intestinal lymphoma with lymph node involvement and bowel infarction are all possible. Lymphoma versus lymphadenitis lymph node presentation. Age related renal changes. Recommend evaluation of the culture and cytology with IV fluid support, broad spectrum antibiotics and stabilization of this patient for potential surgical resection depending upon cytology results. Very guarded prognosis. Plasma expanders and plasma transfusion would be ideal given the low albumin. Plasma transfusion, Ampicillin, Metronidazole and nutraceuticals as well as pain management would all be warranted. A very guarded prognosis was given. If surgery was not performed and lymphoma was present then chemotherapeutic intervention may allow for reduction of much of the small intestinal presentation. However, ideally this would be resected. Persistent intestinal dysfunction will likely occur. If surgery is not performed then a recheck sonogram was recommended after initial chemotherapy to assess for progress in therapy. Portion of dilated small intestine with partial obstructed pattern luminal fluid notes variable regions of mural detail loss and hyperechoic surrounding fat attached to the serosa which is indicative of a transmural pathology but not necessarily neoplastic. Portion of infiltrated small intestine is noted with regional, localized free fluid and inflamed ill-defined fat. 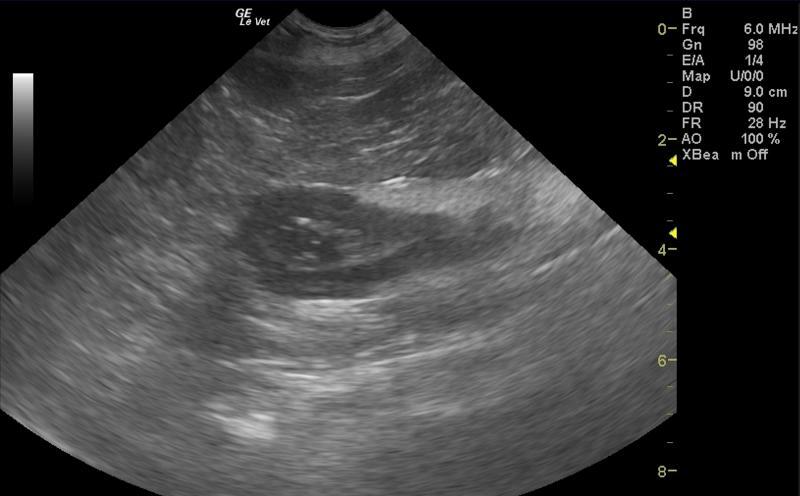 At 2-3cm of depth, dramatically hypoechoic mesenteric lymph node also enlarged.